LEN 101 was the solitary Guy Wulfrunian purchased by Bury Corporation in 1961. (Fleet number 101.) It had Roe H43/30F bodywork, but carried a Park Royal manufacturers’ plate. This was to allow it to be exhibited at the 1960 Commercial Motor Show; as the Roe stand already had enough exhibits, there being strict limits on the number of vehicles each manufacturer was allowed to display. It had another unique feature, three part platform doors. Bury Corporation ran the Wulfrunian for only three years, and for much of this time it was relegated to peak hour use. 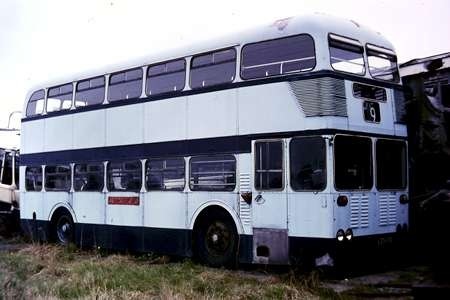 It was sold to an independent operator in South Wales, Howell and Withers, who painted it grey and white, but only operated it for a short time before selling the bus to Wrights, Penycae in August 1964. Wrights operated it on their stage service into Wrecsam for five years.. Wrights painted the bus into this attractive two tone blue livery. It was with Wrights that I had my only ride on this bus. Eventually LEN 101 was sold again, this time to Berresfords of Cheddleton, who operated the bus for only a few days. Apparently drivers complained about the heavy steering; so proprietor Jim Berresford took it for a test drive, after which he dumped it in the field behind the Depot, where this photo was taken. The Wulfrunian was eventually rescued by a group of preservationists from the Manchester area, with the intention of restoring it to Bury Corporation’s light green and cream livery. It was parked in the yard at the rear of Manchester’s Hyde Road depot, which was used for initial training by the PTE’s driving school. Sadly, one of the training buses reversed into the Wulfrunian, and it’s body was written off. Apart from the grilles for the Cave-Brown-Cave system, the really fascinating thing about this bus is what on earth prompted Bury, a Leyland/AEC operator to plump for a Guy and without the Leyland engine option Guy offered. Further, how did the purchase slip past the Transport Committee. Looking at its one-off status and commercial motor show exhibit background, followed by Bury’s operational lack of enthusiasm, this may have been an offer that they couldn’t refuse, but then didn’t quite know what to do with it. Further to Don McKeown’s post on the Bury Corporation Wulfrunian LEN 101, I attach a picture of it after being damaged in the Training School yard at Manchester’s Hyde Road Depot. It was apparently a Mancunian which did the damage. This picture is from my collection and is not my copyright. I think it is easy to overlook the high level of interest shown in the Wulfrunian at the time of its introduction. Operators were looking for a forward entrance high capacity bus but there was a lot of nervousness about the rear engine concept offered in the Atlantean. The two demonstrators were kept very busy and appeared with many of the large operators. Bury was just about to start on a major fleet update to replace their fleet of early post-war PD1’s and PD2’s and 101 was probably bought as a test bed for a potential replacement vehicle. They could have saved a lot of money and heartache if they had taken one of the demonstrators for a spell. I remember 101 with Bury and it seemed to spend most of its life parked by the doorway of the Rochdale Road garage. I was told by one of the fitters that it was disliked by drivers because of the heavy steering and very cramped cab. I did see it in service on the 9 (Jericho – Tottington) and 37 (Walmersley – Whitefield) occasionally. It is a great pity that it was damaged in the collision at Hyde Road as despite its failings, it was a key part of the transport heritage of the north west. I believe the chassis still exists at Dewsbury Bus Museum. Can anyone confirm? 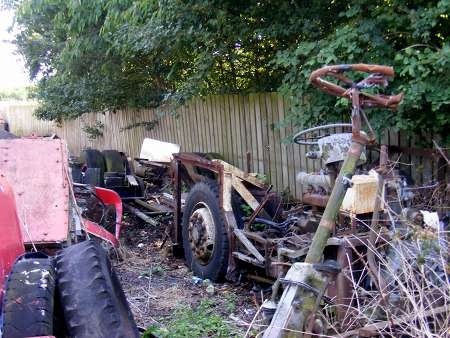 The chassis still survives, and is currently parked among undergrowth at a preservation site near Selby, where it is owned by Mr. Ian Hunter of Leeds. The above photo shows the chassis as it was in the summer of 2014. I am pleased to see that this rare chassis still survives, I hope it can be restored before it rusts away. I’m sure the steering will not feel so heavy without the bodywork. I’ve got it in my head that Wright’s of Penycae were not the second Welsh independent to operate LEN 101, but the third. I could even suggest a third operator’s name – can anyone confirm? As to why Bury didn’t insist on the use of one of the demonstrators (are we sure they didn’t have one? ), the borrowing of a manufacturer’s demonstrator wasn’t something which was as easy as people probably imagine. A manufacturer needed to be sure there was an order in the offing before a demonstrator became a possibility. I have actually been in an operator’s office when the operator asked the rep if there was any possibility of having a vehicle on demonstration, and the response was an emphatic ‘no’. As to whether the use of a demo would have helped depends upon how quickly the Wulfrunian’s failings made themselves felt. In view of how quickly operators generally disposed of them the answer would appear to be, very quickly indeed, yet West Riding continued to buy them until 1965. Were West Riding simply stubbornly reluctant to admit they’d made a mistake, or were they obliged to buy a certain number as part of the original deal? 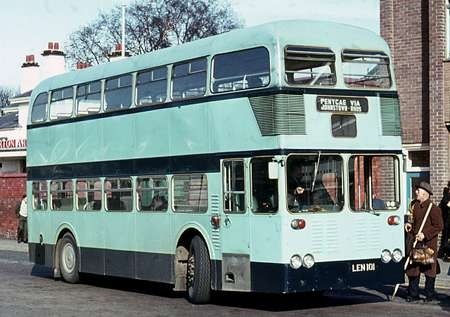 I remember in the 60`s Bury did have an Atlantean from Coventry, it was in the colours of Coventry, Blue with a white band. It was a surprise as I was going home from my then girlfriend from Bolton to Bury, I remember the driver telling me it was on loan from Coventry. I remember LEN 101, it seems a shame lying in the under growth with no body. I know you can’t always rely on Wiki, but, the Wulfrunian article on there says that it was developed jointly by Guy and West Riding. If that was the training bus that did the damage, then I’m hardly surprised that the poor trainee didn’t have full control of the Macunian. From the photo, it doesn’t look as though it’s got an engine ! The Development of the "Wulfrunian"
Guy Motors were going to be left behind in the race to develop an up-to-date low height 30′ long chassis, until West Riding Motors of Wakefield, at the instigation of their chief engineer, Ron Brooke, approached Guys with an advanced specification for such a chassis. In the mid 1950s, following the lead of General Motors in the USA, whose GMC type 4104 air suspended Scenicruiser had been adopted by Greyhound from 1953, Guy Motors became convinced that the future for successful passenger chassis sales lay in air suspension. This initial interest led to the underfloor engined Victory, which had air suspension all round, independent at the front, and air hydraulic disc brakes. The first Victory appeared in 1958, and during the model’s development, Ron Brooke, the Chief Engineer of West Riding, approached Guy with the idea of a low frame double deck chassis incorporating the air suspension features of the Victory, but employing a simple, straight drive line from a front mounted engine. This, it was thought, would give a reliable drive line and permit the entire interior of the lower deck to be used for passenger accommodation. At this time the early Atlanteans were suffering extreme problems with their rear engines/gearboxes and angled drive lines. It would seem that he had hawked his ideas round other manufacturers to no avail (I bet that all those sceptical makers breathed huge sighs of relief when the Wulfrunian’s troubles came home to roost). West Riding was a confirmed user of Gardner engines in its Arab fleet, and the 6LX was chosen as the power unit of the new Wulfrunian. Though not a heavy engine in comparison with its contemporaries from other UK manufacturers, the 6LX was physically large, and positioning it as far to the offside as possible to allow a respectable platform area resulted in a very narrow cab and footwell. To add to the driver’s woes, his/her left leg was unavoidably positioned hard against the engine cover panel, on the far side of which was the Gardner’s offside exhaust assembly. Because of the substantial weight at the extreme front of the overhang, the front wheels had a remarkable negative camber that contributed to the very heavy steering characteristics. The shrouding by the bodywork of the disc braking system sometimes caused the hydraulic fluid to boil, leading to a frightening loss of response. The subsequent history of the Wulfrunian’s operational career is well known, but it is surprising that the deficiencies of the design were not recognised and acted upon in the prototype stages. Looking at the chassis diagrams, it would seem that an answer might have been found by following the AEC ‘Q’ concept, and repositioning the engine to the offside close behind the front wheels. The transmission line would have had to be moved a bit, but the rest of the chassis could have stayed the same. The use of full air rather than air hydraulic for the brakes would have sorted out the braking problem at a stroke. Several modifications were made during the production run to try to fix the problems that arose, but the firm just ran out of money. We now know that Guy was already in severe financial difficulties at this time, following its agency debacle in South Africa, so it just stuck with a flawed design that had gained definite orders from West Riding, and turned a blind eye to the inevitable outcome. Petras409, either the photo or Stephen’s comment is misleading. The Training School used a variety of vehicles. Those on the public roads were normally dedicated vehicles, permanently marked with L plates. Within the grounds at Hyde Rd, this wasn’t always the case. It very much looks as if the GMT vehicle has done the damage. If so it looks as if it was a withdrawn vehicle being used ad hoc for basic training which has had its engine removed after the event, but it is a SELNEC/GMT Standard, not a Mancunian. A fascinating tale, Roger: the sad bit is that the design could have been developed in the way that you suggest: sitting in a modern megabus makes you itch to make use of the space under the stairs! You can see now the fundamental flaws in the Wulfrunian design caused by the desire to get a bulky engine, a driver, a staircase and a passenger platform in to 8ft. The curiosity is whether the driver was protected by the engine or couldn’t get into the saloon direct to deal with troublemakers: perhaps a good thing! We were in a time when men were men and standing up to turn the steering to full lock not unknown- but plonking all that weight at one end in the overhang was possibly worse than plonking it at the back. All would have been solved with your Q2 with a touch of Lodekka, perhaps. What a link, John D to pics of so many Wulfrunians. Did Roe body all the "standard" ones? The Accrington version would have been a good test-bed for a lot of the technology without the overhang problems. Did the Victory have the same sort of problems? And what happened to all those West Riding Wulfrunians- straight to scrap with engines, too? Joe, from reports I have read, most if not all of West Riding’s Wulfrunian engines (Gardner 6LXs) went into the ‘Wulfie’ replacement Daimler Fleetlines. Brendan: I wondered about that… the subsequent West Riding VR’s used to gurgle like the Wulfrunians: why did West Riding buy up all those Wulfrunians? To get a load of cheap engines! One of the perceived advantages of the Wulfrunian layout was the availability of the entire lower saloon for passenger accommodation. It was rather ironic that, when the excessive front end loading difficulties arose, West Riding removed the upper deck seats in front of the staircase, and barred off that area completely, thus totally negating the extra seating downstairs. I followed John D’s link above and…. At the risk of offending anyone on here, I think the only comment I’d make is that the Accrington rear entrance Wulfrunians (picture on John’s link Fleet Number 157 / Registration 36 VTF) deserve an honourable mention on the Ugly Bus Page !! I’m a fan of East Lancs products (having lived in Stockport for many years that’s a given!) but will accept your nomination and would ask our leader to do the necessary!! Stuart C/Phil: I’ve seen worse- looks better as sold on with the "radiator" panel contrasted. See this link. If you are putting this bus into Room 101, then you may have to add a BMMO D type- but which one? D7? Not the D7, Joe, but the D5, which, with its droopy, sad expression always suggested that it was about to burst into tears. I think that it would take quite a leap of the imagination to visualise the Wulfrunian metamorphosing into the D10:- low floor/high floor, front engine /underfloor engine, air suspension/rubber suspension etc. Here’s LEN 101 operating for Wrights, loading up in Wrexham Bus Station for Penycae just before 5 pm on 12 April 1969. 1) Air operated drum brakes. 2) Steel suspension: At front: Routemaster, unequal wishbone with spring over shockers set up, with the addition (if room) of torsion bars to stiffen the whole thing up and the ability to adjust ride height. With this arrangement front wheel camber angles could have been normalised. On the rear: The coil spring set up as on the F series Bristol Lodekka. 3) Power steering (the contemporary Routemaster had it). 4) ASAP an 8’2 and a half" body, to give the driver. Put all that together, although front brake and tyre wear are always going to be heavy with this set up, a it might have been largely OK.
Berresford’s ex Wilts and Dorset (originally Silver Star, Porton Down) Royal Tiger rounds the perimeter road of Longton Bus Station on 20th June 1971. This coach was new to Silver Star in July 1952 with a Leyland C41C body as built in large numbers for Ribble. It was fitted with the Harrington Contender Mk IV body in July 1956 after a serious accident earlier that year. It passed to Wilts and Dorset in June 1963 when that Company took over Silver Star’s operations. This information is taken from a series of articles on Silver Star in Buses Illustrated from February to April 1965. Jim Berresford operated a mixed collection of second hand vehicles from his premises at Cheddleton. HWV is showing ‘Private’ on the blind but it could just as well have been operating on Berresford’s Longton – Leek service. A collection of contemporary PMT buses are in the background. One of the final (1962) batch of Atlanteans of Stoke Depot on a Longton – Newcastle Estates working pursues HWV into the bus station whilst farebox fitted Roadliner 1063 of Longton Depot awaits its next trip to Blurton. Just in view is short Leopard 1124, another Longton allocated bus. If I remember rightly, Berresford’s was a bit of a rough and ready operation famous for it’s bus grave yard – old buses were simply dumped, withdrawn, in adjacent fields. 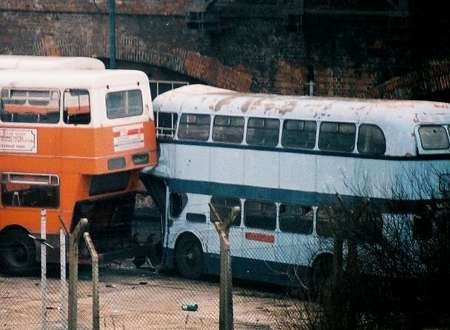 They were big Leyland fans and had a number of ex Stockport all Leyland PD2s. Maidstone & District – AEC Reliance – TKM 329 – C329 . The Silver Star version seen above is rendered even uglier than the M&D style, in my opinion, by the grotesque front grilles that seemed to anticipate some of the later aberrations from the Duple stable. Thankfully, Harrington went on to redeem itself with the stylish Cavalier. The whole frontal appearance makes the body a potential Ugly Bus Page contender. I’ve seen this vehicle described as a Contender before, but surely it is a Wayfarer III? As far as I know the Contender model was for semi-chassisless vehicles such as the Commer-Harrington TS3s. However, for many years the LDB registered Harrington coaches delivered to North Western in 1958 were described in enthusiast publications as "Contenders" rather than Wayfarer IVs which is what they actually were! In that case the error went unchallenged until the vehicles had already been sold by NWRCC. Do we have any Harrington experts on board who can clarify this? And the coach wears a sad face to express its own thoughts on its appearance, Phil. The body is a Harrington Wayfarer Mk 3, rather than a Contender, which was Harrington’s integral model fitted normally with a Rootes TS3 two stroke engine, apart from some for BOAC which had Rolls Royce petrol engines. The Wayfarer Mk 3 is described here:- www.thcoachwork.co.uk/way3.htm . Maidstone & District had a large fleet of centre entrance Wayfarer/Reliances but also 3 similar looking but front entranced Commers, all of which were "TKM" registered. You could say that Berresfords was a rough and ready operation but what a fascinating one! I always loved a trip from Leek to Hanley on the 16, or to Longton on the 106 because you really didn’t know what delight from the fleet would turn up next. 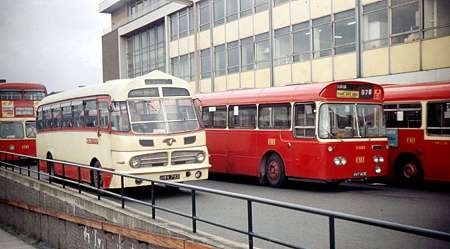 I remember an ex-St Helens AEC Swift being on the stand in Longton bus station once and the driver couldn’t get reverse gear, all the passengers, some of whom were quite old, dutifully got off and helped to push the bus off the stand! It must be said though that everything Berresfords operated was smartly painted in fleet livery of red and ivory with the fleetname quite professionally applied. They were nearly always fitted with a destination blind of some sort. Such a shame that Jim Berresford’s untimely death brought it all to an end, it was one of those truly characterful operators which are sadly missed. Recent contributors may be interested to know that my book, Berresfords Motors of Cheddleton, is due to be published this week by MDS Books/Venture Publishing. Yes indeed Eric, I enquired about it at last Saturday’s Transport fair at the Manchester Museum. This is one volume I’m really looking forward to! I’ve just finished reading Eric’s book and can heartily recommend it. A decent history of Berresfords has been needed for donkey’s years and Eric has finally come up with the goods – and I would still be saying that even if we didn’t share a publisher! Eric, I have just purchased and read your superb book on Berresfords, an operator that has long fascinated me (and no doubt many other enthusiasts) even though I only visited the depot a couple of times. A couple of points – you don’t mention in the book the large number of vehicles which must have been purchased for spares only, on both my visits a lot of the derelict buses seemed to fall into that category but I doubt there is any record. Amongst others the "West’s" RTL, and on my second visit a Western SMT Fleetline, GMT ex North Western RE and several ex NBC single deckers. My second query is how did Jim decide on withdrawal whether to keep a vehicle round the back for spares, or sell it on either for service or scrap. And whilst many obviously stayed in the yard for years, other derelicts must have been disposed of long before the PMT takeover. Thank you, gentlemen, for your kind comments regarding my book. With regard to the withdrawn vehicles and those purchased for spares, there were two reasons why this aspect could not be covered. Given the large number of vehicles which fell into these categories over the years, it became obvious that other text or photos within the book would have to be forfeited in view of space limitations. Secondly, although there was much information available about many vehicles acquired for spares etc., it was known that the list would certainly be far from complete and it was decided not to produce an incomplete list. From the early 1950s some vehicles withdrawn from the fleet were cannibalised and the bodies cut up rather than sold on. Some vehicles acquired for spares were treated similarly, whereas others donated useful major units and other parts and then were used for parts storage. One double-decker bought in 1949 actually donated its staircase which was incorporated into the rear of the extension of the office and workshop block! Unfortunately, I did not become aware of this until the book had been published.